McKesson Island Dressing is a sterile primary or secondary bordered non-adherent gauze dressing. 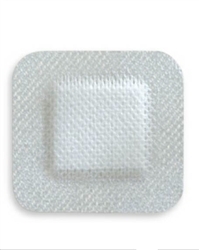 They offer the convenience of an all-in-one dressing by combining an absorbent non-adherent central pad surrounded by a breathable adhesive border. McKesson Island Dressings are an excellent alternative to gauze and tape. The non-adherent pad in the center is designed to avoid disrupting the wound bed upon removal.